The Institution of Engineering and Technology, with its principal place of business at Michael Faraday House, Six Hills Way, Stevenage, SG1 2AY, United Kingdom (herein referred to as 'the IET') grants you the right to access the Licensed Materials available on the IET Digital Library platform, subject to the following terms and conditions. By accessing the IET Digital Library platform, you will be deemed to be giving your confirmation that you have read and agree to be bound by all these terms and conditions. 1.1. The IET permits you to either purchase and download articles or eBooks or subscribe to one or more journal titles via a user ID and password, for the purposes of private research and study. 2.1. You agree to maintain your User ID and Password as private and confidential information and must not be divulged to any other person. Unauthorised use of your Use ID and Password for online access with or without your knowledge is a breach of this Licence and a violation of the IET's copyrights. The IET reserves the right to deny you access to the IET Digital Library if it believes that other people are accessing the IET Digital Library through your user details. 3.1. You are permitted online access to the Licenced Materials and may download, save, or print text, solely for private use or research. You may only use this online access in a way that conforms to all applicable laws and regulations. 3.2. The IET grants you permission for brief quotations from the content of the Licenced Materials with the customary acknowledgment of the source, and to copy and transmit content from individual Licenced Materials in 'person-to-person' and non-systematic scholarly exchanges of information between specific individuals. 3.3. You specifically agree that use other than indicated above is a violation of the terms of this Licence. 4.1.3. Systematically or programmatically download (e.g., the use of automated 'robots' or otherwise) or attempt to download in a short time period large amounts of Licensed Materials from the IET Digital Library, such as full text articles from entire journal issues or extensive search results. 4.1.5. reverse engineer, decompile, alter, abridge or otherwise modify the Licensed Materials or any part of them for any purpose whatsoever, except as expressly provided in this Licence. >4.2.4. alter, abridge, adapt or modify the Licenced Materials, except to the extent necessary to make them perceptible on a computer screen. For the avoidance of doubt, no alteration of the words or their order is permitted. 5.1. The IET Digital Library is copyrighted by the IET. The Licensed Materials and their content, including abstracts, are copyrighted as indicated within the publication. The search software used on the platform is copyrighted by Publishing Technology. The IET Digital Library and Licensed Materials are subject to all applicable copyright, database protection and other rights under the law of the United Kingdom and other countries. Copyright notices in the IET Digital Library Licensed Materials may not be removed, obscured, or modified in any way. Unauthorised copying or redistribution of any IET Digital Library content is a violation of copyright laws. 6.1. 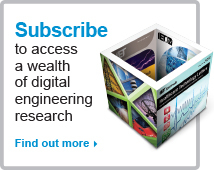 Following online access approval for an online subscription, you will be permitted to attempt online access to the IET Digital Library at any time. The IET, however, will not be liable for any delay, downtime, transmission error, software or equipment incompatibilities, force majeure or other failure of performance. The IET will use commercially reasonable efforts to correct any material performance problem brought to its attention and may suspend performance pending such correction. 7.1. This Licence will become effective on receipt by the IET of the payment for an annual subscription, and, subject to the terms and conditions of this Licence, will remain in effect while you maintain a current paid subscription to the Licensed Materials. In the case of purchase of article or eBook downloads, this Licence will remain in effect in perpetuity. 8.1. For online subscriptions, this licence will terminate if the online subscription lapses. Termination is effective at the end of the paid subscription period. 8.2 The IET shall also be entitled to terminate this Licence by serving you written notice if you are in breach of any of these terms and conditions and in the case of a breach which it is possible to remedy, you have not remedied the breach within thirty (30) days of receiving notice from the IET specifying the breach. 9.1. EXCEPT AS SET FORTH IN THIS LICENCE, THE IET MAKES NO WARRANTY OR REPRESENTATION OF ANY KIND, EXPRESS OR IMPLIED, WITH RESPECT TO THE LICENCED MATERIALS INCLUDING THEIR QUALITY, ORIGINALITY, SUITABILITY, SEARCHABILITY, OPERATION, PERFORMANCE, COMPLIANCE WITH ANY COMPUTATIONAL PROCESS, MERCHANTABILITY OR FITNESS FOR A PARTICULAR PURPOSE. 9.2. THE IET SHALL NOT BE LIABLE FOR: EXEMPLARY, SPECIAL, INDIRECT, INCIDENTAL, CONSEQUENTIAL OR OTHER DAMAGES, ARISING OUT OF OR IN CONNECTION WITH THE PURCHASE OR LICENCES GRANTED HEREUNDER, THE USE OR INABILITY TO USE ANY 'IET' ONLINE PUBLICATION, THE IET’S PERFORMANCE UNDER THIS LICENCE, TERMINATION OF THIS LICENCE BY THE IET OR THE LOSS OF DATA, BUSINESS OR GOODWILL, EVEN IF THE IET IS ADVISED OR AWARE OF THE POSSIBILITY OF SUCH DAMAGES. IN NO EVENT SHALL THE TOTAL AGGREGATE LIABILITY OF THE IET FOR ANY CLAIMS, LOSSES OR DAMAGES ARISING OUT OF ANY BREACH OR TERMINATION OF THIS LICENCE EXCEED THE TOTAL AMOUNT PAID BY YOU TO THE IET IN THE YEAR DURING WHICH SUCH CLAIM, LOSS OR DAMAGE OCCURRED. The foregoing limitation of liability and exclusion of certain damages shall apply regardless of the success or effectiveness of other remedies. No claim may be made against the IET unless suit is filed thereon within one (1) year after the event giving rise to the claim. 10.1 Pay-per-view items purchased cannot be returned, refunded, or exchanged. If, for any reason, you believe that the payment was made in error, you may send your request for a refund by contacting [email protected], stating your WorldPay transaction ID number which is quoted in your order confirmation email, and also the reason for the refund. If you experience any problems downloading content, please contact [email protected] for assistance. Any refunds will be given at the discretion of the Institutional of Engineering and Technology. 11.1. This Licence constitutes the entire agreement between you and the IET and supersedes any prior communication between you and the IET with respect to the subject matter hereof. The headings used in this Licence are for convenience only and are not to be considered in construing the terms of this Licence. Subject to termination under Section 8, this Licence may be amended only by consent (via mail, email, or fax) of both parties. If the IET sends notice to you of changes in the terms of this Licence, lack of response by you within a thirty (30) day period will be taken as acceptance of the new terms. You may not make any changes to this Licence without written consent by the IET. 11.2. You must pay any taxes (including but not limited to any applicable Value Added Taxes, Sales Taxes, and Import Taxes) other than taxes on the IET’s net income, arising out your use of the Licenced Materials and/or the rights granted under this Licence. 11.3. You may not assign or transfer your rights under this Licence. 11.4. This Licence will be governed by, and construed in accordance with, the laws of England and Wales. Questions concerning this Licence or any changes to it may be directed as above.